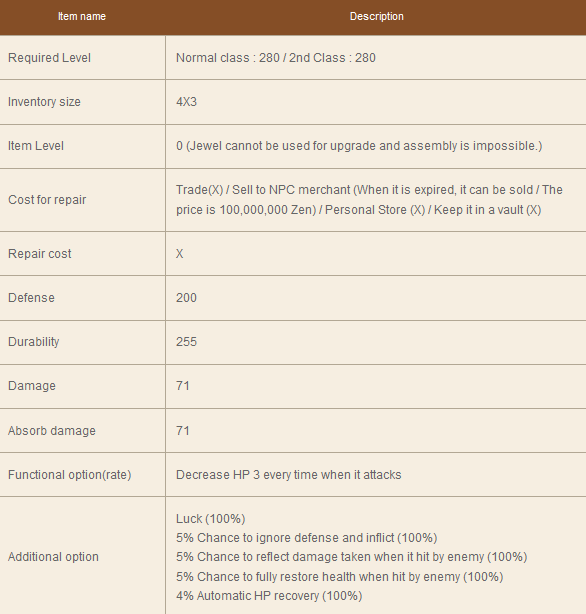 You can enter through NPC Mait (131/146) who is in Lorencia to join Chaos Castle Survival of the Fittest. If your level is over 280, anyone can join. It begins the first day every month and it is divided preliminary round and the semi-finals and it is progressed for 6 days. The rule of Chaos Castle Survival of the Fittest same as previous Chaos Castle and obtained point from Chaos Castle Survival of the Fittest will contribute to move next ranking. Obtained score will reflect rank at the same time as Chaos Castle Survival of the Fittest is finished and you can check your rank through the entrances NPC. You can check characters those who advanced for the final battle through NPC after finished the last game. If you are a murderer, you might be restricted. From 1st day to 6th day every month. Min. numbers of beginning members is 5 and maximum is 70. Between 1st and 20th, accumulated score from preliminary round, will get chance to advance for the finals. The rule of progress is same as previous rule of Chaos Castle. Ranking is reflected by adding accumulated score after the last battle of preliminary battle, from 1st day to 3rd day every month. Ranks 1 to 20 will advance to the Semi-Finale battle. Top 10 ranked players from the finals can enter. 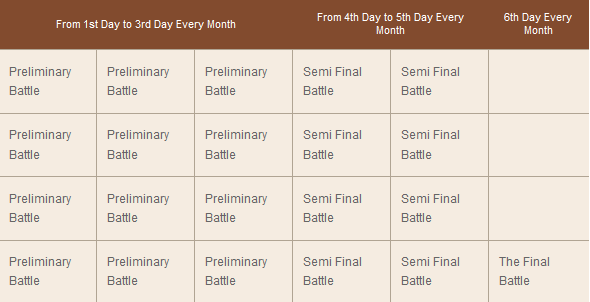 It is progress for 6 days every month and the final winner will be chosen through 1 game in the finals. The final winner will be registered Hall of Fame and at the same time, Wings of the Conqueror will be given (Periodical item). All games are calculated in the same way. When the point is low, players at lower level and lower experience point will be prioritized. Preliminary round / the finals will be initialized, when you advance for the next game and the final game will be hold one game to be selected the winner. If the winner is not selected in in limited time, the winner will be selected by the following rule. When you click NPC Mait, a window of Chaos Castle Survival of the Fittest will pop up. 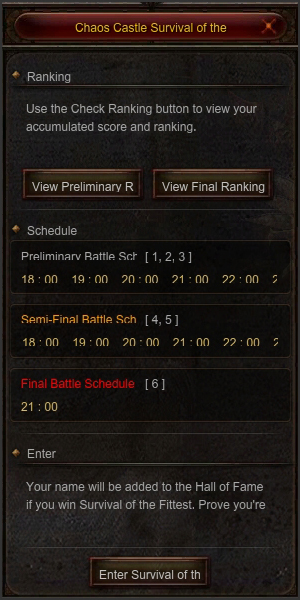 When click ‘Check Ranking’, a ranking window will pop up. The medium reward is same as before. However, the reward will be randomly given. Final rewards are same as before such as Jewel of Life, Jewel of Creation, set items. 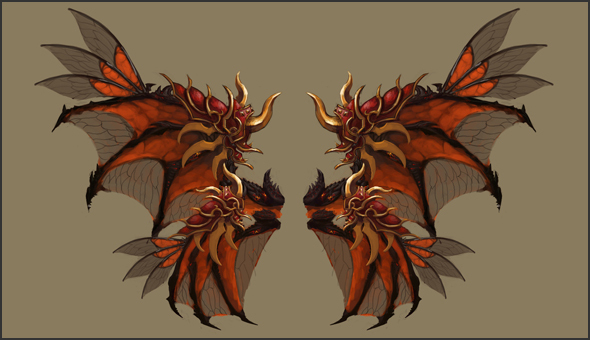 The final winner will be recorded on Hall of Fame [Web Page] and ‘Wings of the Conqueror’ will be given at the same time. Vigant, Leonardo and BIiZzArDK like this. Hi, thanks for the guide! It is really detailed and well presented. I have one question - who wins the final battle? Is it the last player standing on the ground as in normal cc or a guy with the best scorecount? Tournament progress part explains that. You advance into the semifinals and finals based on your ranking points count and the final winner is decided through 1 game in the finals. yeah, but my question is for the final game - who wins? the person winning the cc or the person with most points accumulated in last game? Final winner into the final battle is the last standing person, @Leonardo. the CC event survival of the fits is ended and i was the last stand man but i didnt get the wings it was given to smone else can u explain this plz and change ?! 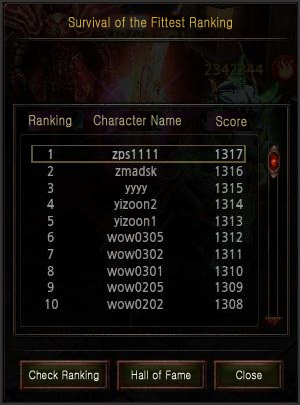 If you didn't won it's because the event is based on the final rankings as written into the webzen guide, cc victory just brings extra bonus points and in case you're tied it will help you get the wings. This is the way event works, there is nothing to be changed. 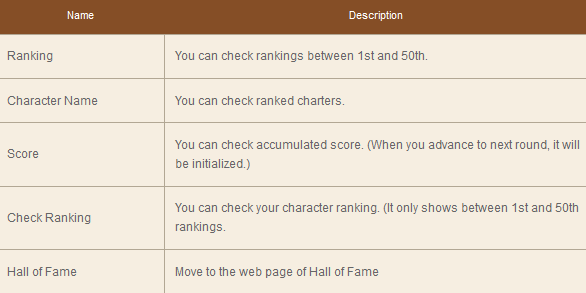 @Gix probably mixed the answers in the previous post but the guide (even if it's a bit confusing) talks about score rankings for all event stages. Why not? The winner for this edition was a dark lord. Well if the higher score wins , bk has no real chance in front of other classes which hit much more many mobs => higher score . In my opinion Finals should be won by the last man standing , so everybody got a chance . Kill more players, be the chaos castle survivor and you will get more points. The monsters are spreaded around the castle so everyone gets the chance to kill them. Not sure how you imagine this but a wizard cannot stay in the middle, not get killed by other players or pushed away and at the same time kill all monsters inside the castle to think this alone would bring the victory. The even can't be adusted for personal preferences, it works the way webzen designed it and if a dark lord won it then a bk can win it too, it's up to the player to find his strategy as it happend today by winning against enemies with higher aoe radius. Extazy, Sm0uker and BIiZzArDK like this. If the winner is not selected in in limited time,( this should mean by the time CC time passes and no one last stand or all died) the winner will be selected by the following rule. doesnt that mean so u can win it first of all by last standing and if u fail its calculated after this by max points ! The image explains how points are being calculated for all games (which is why the 3rd table column is there) but in case the time is up with no last stand or if everyone died then only Monster kill + Player kill points will be added as per the reference image that is added. You focused on killing more monsters while your opponent killed more players besides killing regular monsters which brought him more points. I invite u to join us as a bk next time , i really want to see u how u over point those sumoners/dl`s/sm`s. 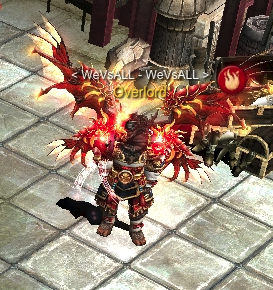 Ofc webzen made it this way cuz on non res server the AOE spells cant 1 hit a mob, just think about it. I suppose you didn't played the official server but aoe spells can kill a cc mob with 1 hit alone just fine (cc mobs have 50 def and 700-20k hp) even if not using buff scrolls, the difference is that there are less monsters due to more players joining the event. Your example is exaggerated and you have today's cc as a proof but if you want the event mechanics to be changed you should forward this to webzen itself as private servers won't be able to do it, we all play their game not viceversa. Ok i understand that u can`t change it, its fine , but dont tell me i can stand a chance on a rr serv as a bk when its clear that i don`t. 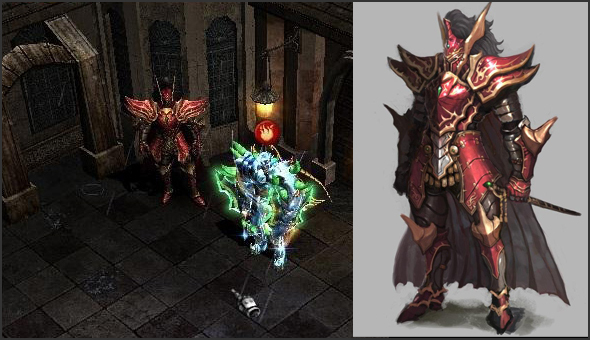 Maybe u will consider to make a mounthly event for bk`s (or for all classes) like a duel tournament or something where we (the bk`s) have the same chances as other classes to win a pair of wings. Just a little sugestion. If you don't stand a chance then somebody else will and time will prove it. One thing I noticed, you always seem to be aggressive with the others in your posts, might want to control that. Well ,to be honest, i do am a little bit frustrated , but who wouldn`t be ? I invested some money in the game , and above all so much time. I did even skip some other activities that i had to do for this event. Anyway sorry if i was too agresive in my post , i didn`t mean it. Yeah as u said time will tell, but i doubt a bk will win it any time soon.